The headlines today are screaming that a mere 7% of ESA claimants aren’t fit for work. 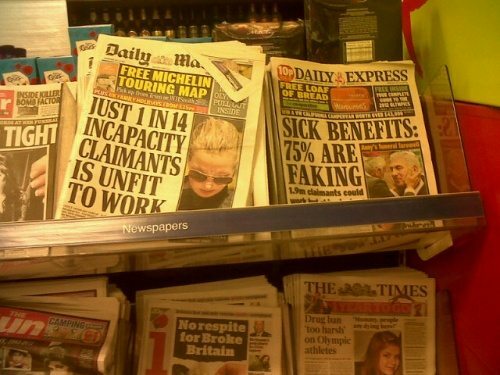 The Daily Mail says that “Benefits Britain marches on: Just one in 14 disability handout applicants are too ill to work” while the BBC claim “Tests claim few benefit claimants unfit to work” These figures are grossly misleading. They actually come from a Department of Work and Pensions press release, 26 July 2011 – Work Programme provides tailored support as latest figures show people are being found fit for work. The news stories haven’t actually mislead about the contents of the press release too much, the propaganda comes from the DWP. Assuming that changes in health conditions account for a chunk of that 61%, let’s say a third, that still leaves the rest. Here’s the thing. The accuracy of the testing process has been found to be wrong, broken, inadequate, however you want to put it, by MPs, a house of commons select committee, many disability rights charities, and many many individuals and activists.Even a person involved in designing the test has said that it is not fit for purpose.